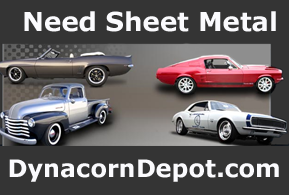 When it comes to a good Mustang restoration there are some equipment needs that most enthusiast doing their own work never really consider. Aside from the basic tools including screw drivers, wrenches, sockets and pliers there are three pieces of equipment that will yield much higher quality than a scrub brush and soapy water. An air compressor is one of these items. 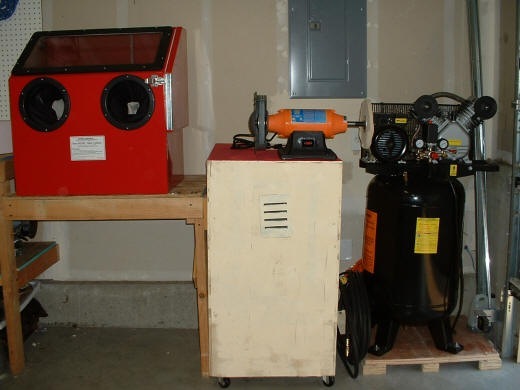 A small air compressor will get most of your disassembly, assembly and general purpose air tools running but may not be sufficient enough when it comes to running the next important piece of equipment, the media blast cabinet. 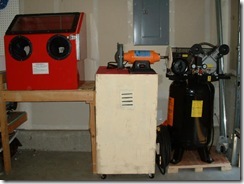 A media blast cabinet is one of the most used pieces of equipment that you will utilize during the restoration process. The blast cabinet can be used for stripping old parts of rust scale and paint, or it can be used to refresh and clean bolts and other components that only require a low level blast treatment. The third piece of equipment that turns out exceptional results is a buffing wheel. If you have stainless steel molding that are in restorable condition such as window molding and window frames you an polish them with the bussing wheel and they will be as good or better than new. I would even polish new window moldings just to get them up to a high show quality standard. 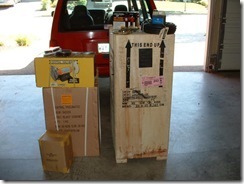 I purchased a bench top blast cabinet and a 29 gallon compressor. I think the compressor capacity should be enough to run the blast cabinet for 15 to 20 minute duration which is plenty of time to get most jobs done. I also re-used the compressor shipping container and turned it into a rolling work bench that I will mount the buffer to when needed.